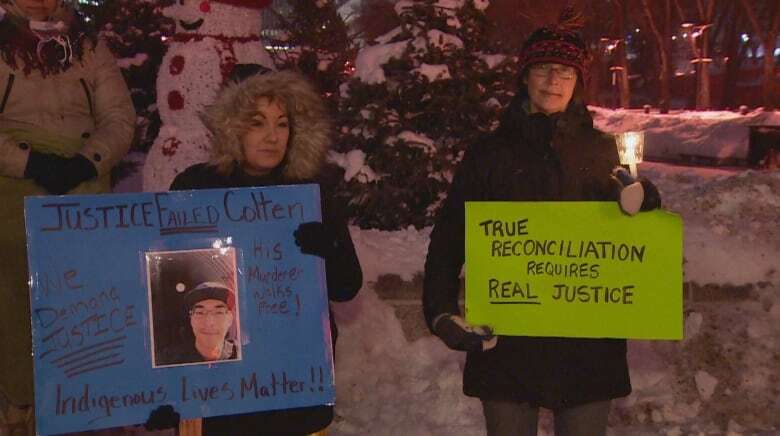 Around 200 people gathered in front of the Edmonton Police Service headquarters in downtown Edmonton on Saturday to show support for the family of Colten Boushie, after Gerald Stanley was acquitted Friday in the Indigenous man's death. 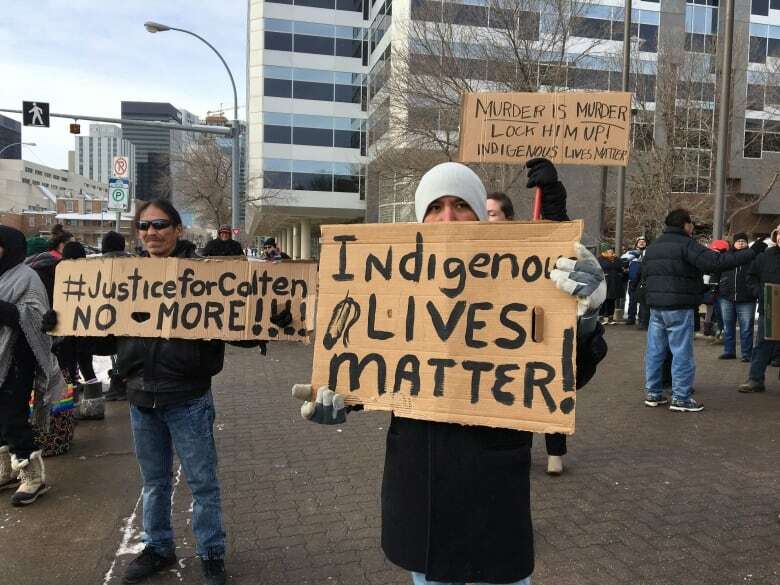 Outrage over the acquittal of a Saskatchewan farmer in the death of a young Indigenous man drew 200 people to a protest in Edmonton Saturday. 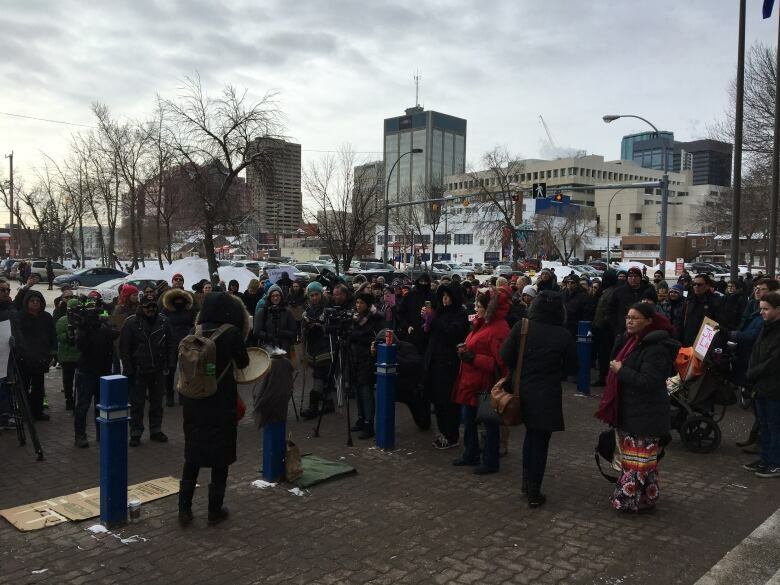 Crowds braved frigid temperatures in a rally outside the Edmonton Police Service headquarters downtown. On Friday, an all-white jury acquitted Saskatchewan farmer Gerald Stanley in the 2016 shooting death of 22-year-old Colten Boushie. "I'm here because I couldn't sleep last night I was so upset. I'm here really to be with other people who are experiencing the same thing," said Chelsea Vowel, who doesn't know the Boushie family. The gathering was one of at least a dozen taking place across the country this weekend. About 100 people gathered at the Alberta legislature Saturday evening for a candlelight vigil for Boushie. Boushie, from the Red Pheasant Cree Nation, was shot in the head on Aug. 9, 2016, after an altercation on Stanley's property. Supporters of Boushie's family burned sage and held signs calling for justice at Saturday's rally in Edmonton. Jodi Calahoo-Stonehouse is a friend of Boushie's sister Jade. ​"We're here supporting her, lifting her, loving her, because we are connected as Indigenous peoples. We recognize that if it's their family, it could be our family as well," she said. "This is painful. This child did not deserve to be murdered and when we talk about reconciliation there's some real work that needs to be done. It is not acceptable to murder our kids because you are afraid of Indian people." Many took turns speaking to the crowd about their concerns and hopes for the future, before marching the two blocks to Edmonton's law courts. Organizer Eriel Tchekwie Deranger says the group chose to march down city streets illegally, without a permit, in defiance of the legal system that ultimately failed Boushie. "We started at the police station because the police are the first people that failed Colten. We're ending at the courts because that's where the system failed him in the very end," Tchekwie Deranger said. "We're demanding justice for a failed system." The verdict has again drawn focus to the treatment of Indigenous people in Canada's justice system. Speaking to reporters in Los Angeles on Saturday, Prime Minister Justin Trudeau would not comment on the court process, but said "we have come to this point as a country far too many times." "Indigenous people across this country are angry, they're heartbroken," he said. "I know Indigenous and non-Indigenous Canadians alike know that we have to do better." But those words weren't what people at the rally wanted to hear from the prime minister. "Condolences are not enough. White tears are not enough. It's time to make real systemic change in Canada. Racism is not acceptable," Calahoo-Stonehouse said. "Colten Boushie isn't the only young person who's been murdered in Canada. This is a massive epidemic of missing and murdered Indigenous people, so we're out here again stating this is not acceptable. You cannot kill Indigenous people and get away with it." In a statement Saturday, Alexis Nakota Sioux Nation Chief Tony Alexis said the verdict has given rise to anger and hurt. He called for the "full recognition" of the rights of First Peoples. "We are a resilient people who have always overcome adversity. We will overcome this too," he said. "This is a call to action. As a chief, I urge our governments, our judicial systems, and our educational institutions to take this opportunity to take real action in creating justice for all. It is only change within these systems that we will eliminate injustices. "Mr. Prime Minister, I am calling upon your government to answer our call for a Crown meeting. That we can join in our leadership to lead our nation forward, together." Tchekwie Deranger said she will continue to call for justice. "The system failed Colten, but it has failed countless other Indigenous people beforehand," she said. "We have to demand change. Not just for Colten, but for all Indigenous people in Canada, North America, and the world over."